Many women believe that their hair lacks shine after they blow dry it. Sometimes you can lose moisture and volume if you don’t use the right products. If you want to avoid damage and breakage you should stick to the right hair products and use as little heat as possible. In fact, you should definitely use a heat protectant spray. A heat protectant is a product that many women avoid since they don’t see the purpose of it. However, know that this is the best protection that you can provide for your hair, no matter the hair type you have. It has substances such as Dimethicone and Cyclomethicone which truly do help with fragile and damaged hair. Actually, most of the sprays, leave in conditioners and serums use a combination of these two elements in order to keep your hair safe..
Cyclomethicone – This is a clear silicone which can make your hair sleek and shiny. It evaporates easily after transitioning nutritious and oils onto your scalp and into your strains. Dimethicone –This substance is great at detangling and conditioning your hair. If you feel like it is impossible to comb it through you should turn to products that have dimethicone. Both of these silicones are FDA approved and can be used on any hair type. Decreases the porosity of your hair: Thanks to hair protectant sprays your hair will be a lot less prone to dampness after you style it. Decreases moisture loss from your hair: If you’ve been using bleach products or if you’ve been exposed to the sun a lot of you’ve probably damaged your hair. Heat protectants are great for fixing up the dehydration. Lubricates the hair surface: Your hair will be smooth, nourished, and easy to style after you’ve applied this spray. I really enjoy using heat protectants because of the above benefits. My hair is always fresh and shiny. If you are wondering how to use this spray just go in straight after washing your hair. Make sure you’ve deep conditioned previously and that you’ve left your hair wet before proceeding with the spray. This way, the product will easily enter the cuticle and soak up into your hair. Use the right tool: Always use tools that contain ceramic coatings on barrels and plates. Bad irons will lead to a disaster. Check the guide: Always read the manual that comes with the heat protectant, or read its labels. Also, make sure you use your iron or blow dryer properly, read these labels and guidelines as well. Use as little oil as possible: Your hair can ”overcook” if you use a lot of oils. Stick to natural and salon recommended options. It is better to have a less effective heat protectant than having none at all. However, if you wish to progress your knowledge on these products, a recent study from the University of Manchester showed that it might be beneficial to avoid all water based protectants and go for dry elements such as oils and solvents like ethanol. Water free heat protectants are more effective than water-based ones. This doesn’t mean that heat protectants with water aren’t effective; they are also great. Many heat protectants also contain elements such as polymers (including polyquaterniums, copolymers, and acrylates) and silicones. Although synthesized, these are among the most researched heat protectants elements in the world. You increase the level of your protectants. You rotate your protectant treatment (about every 2 weeks) switch onto something now and add it to your schedule. Treat yourself to a hot oil treatment once or twice a month. You can also go to a trusted salon and get a keratin treatment. Do some hairstyles which won’t demand hair protectors. You should drink a lot of water. Your body balances its temperature through sweating and releases liquid as you use energy. This effect cools your glands, including your hair follicles. Drink at least 8 glasses of water every day. Once you understand all of the above you should look into your options. Here are the top 5 most recommended protectant sprays for your natural hair! 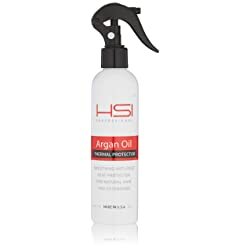 HSI Thermal Protector is a must-have product for ladies who style their hair with curling irons, flat irons, blow dryers, and other heat styling products. This is a great choice for natural hair, as well as for colored hair. Spritz the protectant smoothly from the base to the top before you begin to style the hair. Have no fear since your natural hair will be 100% safe and protected from heat. It will also stay frizz free and hydrated all throughout the process. This product will also give your hair the shine it deserves, no matter if it is wavy or super flat. My friend bought HSI Thermal Protector a few years ago and I must confess that her hair literally always looks great. The product has a strong smell – might not be great for people who are sensitive to strong smell. 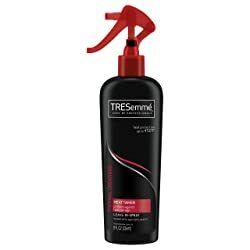 TRESemme Thermal Creation Heat Protectant Spray can achieve a lot on many different hair types. This spray allows you to use any hair styling tool in order to achieve your desired look. It can hold and reform your hairs shape without damaging it whatsoever. Its recovery system can protect your hair from heat gadgets and even blow dryers. TRESemme Thermal Spray is perfect for ladies who love to switch up their hairstyles every here and there. It is filled with moisture-locking vitamin element that helps to protect against hot iron by guiding against heat. This is one of my favorite’s heat protectant on the market today. I really enjoy using it when doing night time hairstyles (big and puffy ones). Some people argue that the fragrance is too strong. The product is not available in some countries. 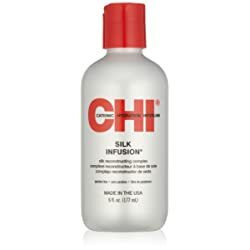 CHI Silk Infusion is a product rich in various treatments. It is enhanced with soy and wheat proteins and contains no alcohol at all. This protectant can deeply penetrate proteins into your hair and make it super silky and shiny. It also has got cationic and ionic hydration interlink technology. CHI has incorporated with a CHI 44 ceramic thermal styling recipe that can protect your hair from frequent use of thermal elements. Silk particles in it add resilience and strength to your hair, as well as moisture (which is great if you have dry hair). The product is highly recommended for curly and wavy hair types but can be used on all kinds. It protects your hair from the environment and thermal styling. It is full of pure natural silk, soy and wheat proteins. It is an effective product and affordable one. Its smell is a bit strong and might give you a headache. This is a professional heat protectant spray that is advanced and well appreciated. It has got a 2 layer protection technology that protects your hair from thermal damage and offers maximum protection from hair dryers, curling irons, flat irons, hair waver and any styling tools. It penetrates your hair follicles deeply and can repair all sorts of damages. It can also prevent split ends from breaking. All of this is possible thanks to its main ingredient, Argan Oil. This really helps with the moisture and the texture of your natural hair. You can have a salon like soft finish with a lot of shine if you purchase this spray. One of its best features is the fact that it can detangle your hair and prevent frizz. It is also suitable for different types of hair, including curly hair, permed hair, natural hair, extensions, and wigs. It protects and shields your hair from damage caused by hair dryers, curling irons, and flat irons. Boasts of an advanced lightweight 2 layer protection technology that enters your hair follicles to prevent and repair hair split ends and damages. The product is highly effective. It improves the flexibility of your hair. It is detrimental to your hair as it might cause some damages. 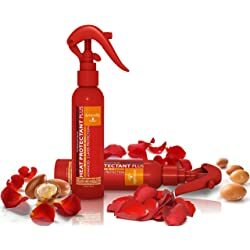 Art Naturals Thermal Hair Protector is the best solution for split ends. If your hair is experiencing some excess humidity, heat, or even sun exposure, natural elements of peach, sage, rosemary, ginseng, and thyme can re-moisturize, and make a barrier against future damage. Your hair is restored and will shine like crazy thanks to this spray and its lovely substances. This protectant can provide a 24 hour deep moisturizing feature. It has got lovely and natural ingredients that can deeply penetrate and add moisture. Highly known for detangling hair at such ease and with minimal effort. I bought this product for my daughter and her hair has really bloomed ever since she’s been using it. It protects and conditions your hair, especially if you dried with a dryer, curling, or ironing. Its herbal elements moisturize and nourish your hair and protect it from future heat. Great for use before outdoor activities. Great detangler for difficult to handle and thick hair. Might not be great for use in soft hair. So many options to choose from, right? These top 5 products are the way to go, as confirmed by many professionals and women worldwide. However, always remember that nothing in the world is 100% safe nor true. For instance, you can have all the tools in the world, but if they are not used right they can mess up and damage your hair. Your priority should be to follow the guidelines and manuals that you have been given. Take some time to understand your new products and learn all of their advantages and disadvantages. When it comes to protectant sprays in particular, make sure you get the one that is made for your hair type. Then on, you can stylishly and successfully enjoy the styling process of your hair. For example, if you are heavily prone to damage from excessive heat, certain types of products, or chemicals, be careful when using them. In addition, curly hair is highly likely to get damaged because at every turn of your curl, your strands are susceptible to break after being force-flattened by flat iron heat or curling iron. Additionally, it is best to use the heat protectant for natural hair before you blow dry your hair. This ensures that the protectant is infused into your hair strand before the hot ironing process begins. It is not necessary to apply the heat protectant when flat ironing your hair because the product has already been absorbed. 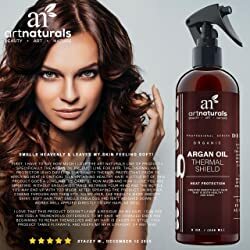 As you might have realized, Art Naturals Thermal Hair Protector is a quality heat protectant as it provides most of the benefits that should be present in these products. For example, it helps to reduce moisture loss and decrease the porosity of your hair. It also helps to lubricate the surface of your hair which is a great feature that should be found in these products. This article is informative and helpful. This is what I needed. I am going to try one of the products that you recommended. Thank you! I greatly appreciate this information. I will try some one else 1 my family’s hair. We have all types. Thanks a bunch!